In the past, "somebody" (I can find the thread no more) proposed to send me a picture how to disassemble a Budd (old generation, NH). And could it damage anything if I put some "contact spray" (with a brush) on the outer sides of the wheels, where the wipers make contact ? Here's a copy of the RDC diagram. This was on the AZL or ZTrack web site(s) at one time, but I can't find it. There are a couple things to be aware of. The trucks have a tongue that slips into the shell (#1 below, but best seen in the exploded view above). You'll need to work the shell over these for removal and reassembly. Each truck also has a drive shaft (#2 above). These are easy to lose and as far as I know impossible to replace. I tie a thread to these to keep from losing them. The ends are actually very tiny gears and for reassembly I first work them into the motor nest then the trucks. You'll probably have to move the wheels a bit to get it to engage. If the shaft isn't engaged right the trucks won't install right. Rather than 'disassemble Johnny-5" . .. . . There are no wheel 'wipers'. 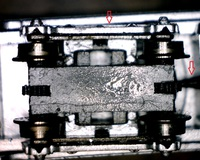 The axle points ride in a 'dimple" (indent) in the metal strip. Use a tip of a sharp object to place the tinyist, smallest drop where you cannot easily get too - the tip of the axle. So, "Contact Spray" to the axle points ? What sort of problem are you having with the RDC? Consider the possibility that the problem is not with the electrical pickups.